Francis Armstrong has finally found the house he has been looking for - a fussy old Victorian in York that is desperately in need of repairs. Armstrong dreams of spending his time restoring the house and the gardens. What he doesn't realize is that his idyll's in the garden will turn up a human skeleton. The remains belong to Muriel Bradbury, the long missing wife of the previous owner. 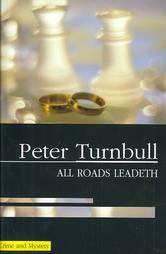 So starts Peter Turnbull's novel, All Roads Leadeth. Set in the English countryside around York the story starts out with the discovery of the bones. It then races through more murders, embezzlement, missing persons, love interests and sticky police procedure. With fast pacing (even thought the chapters are long) Turnbull introduces his 2 crime solvers: DCI Hennesey and Sergeant Yellich. These two quickly put together the clues that lead to the mysterious Sandra Picardie. Picardie had quickly become the second Mrs. Bradbury. She left Bradbury when he encountered financial trouble. She then turns up as the wife of another man whose wife has gone missing. Are they dealing with a mass murderer? Hennessey and Yellich pile clue upon clue as they solve the mystery with the help of the local pathologist, Louise D'Acre. The strained relationship between Hennessey and D'Acre may not be all that it seems, and Yellich has his own problems in the form of a young woman with a "tumbling head of golden hair." This short, fast paced book makes for a good mystery read. The characters are interesting, their relationships with each other are interesting and you just want to come back to them to see what they will solve next.